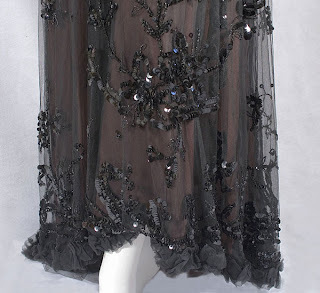 All The Pretty Dresses: Lady Mary, eat your heart out! 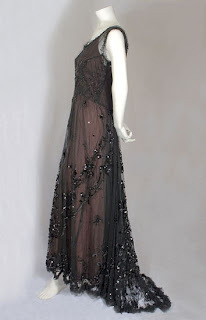 The dress is fashioned from black silk tulle. 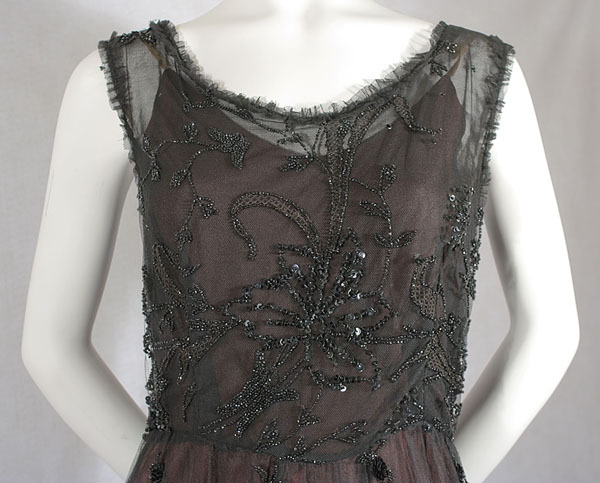 The bodice is lined with black silk chiffon: the skirt is unlined. It closes in back with hooks and snaps. The silhouette of this gown typifies high style elegance, with the bodice is slightly high waisted in front, gracefully dipping lower in back. This contour line is repeated in the dipping skirt hem that forms a train in back. 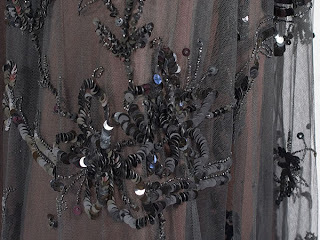 The dress is embellished with floral clusters of black sequins and faceted black beads that sparkle in the light. The leaves are applied braided trim. 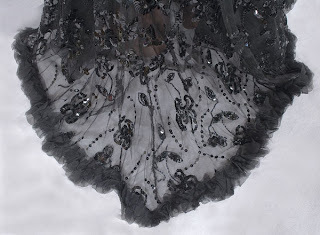 The neckline and armholes are finished with tulle ruffles; the skirt hem has a wider ruffle of silk chiffon—see photos for detail. This type of early 20th century evening dress was generally attached to an underdress / underpinnings with a constructed shape, which would have most likely been black, but the dress is still exceptionally beautiful over a basic slip. 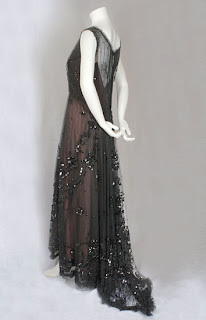 It has been photographed the dress over a burgundy 1930s slip (not included) so you can see the detail of the dress and how a color slip / underdress will change the look. 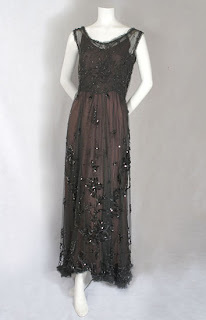 Condition is excellent and it is a wearable size: it measures: 36" bust, 30" waist, at least 45" hip, and 55" from the shoulder to the front hem. We are happy to answer any questions you may have - ask BEFORE you bid! By bidding on or buying this item, you understand and agree to the following terms of sale and the shipping cost indicated below.